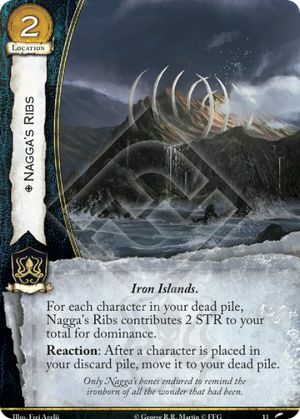 For each character in your dead pile, Nagga's Ribs contributes 2 STR to your total for dominance. Reaction: After a character is placed in your discard pile, move it to your dead pile. The reaction of Nagga’s Ribs does not trigger any “when X is killed” effects. In the case of other cards with reactions to being placed in the discard pile, once a card is moved from the discard pile it cannot be affected by cards that reference the discard pile. For example, if the first player places a Lordsport Shipwright in their discard pile, then triggers the reaction from Nagga’s Ribs, the second player can no longer trigger Now My Watch Begins as the card is no longer in the discard pile.